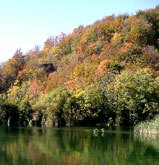 Plitvice Lake National Park epitomizes soul soothing travel. It's Croatia's first National Park and it's a gem. It's tucked up in the delicately shaped hills near the Mediterranean coast. It is easy to get to by car or bus and even easier to navigate by foot. Simply take the park shuttle to the top lake and walk back down the staircase of water and waterfalls. I came in autumn, and I practically had the whole place to myself. The leaves were changing colors adding a new element to this liquid wonderland. Think of Niagara Falls uprooted, transferred in pieces, and then grafted into a New England forest about to explode with autumn color. Every which way I turn, I see water splashing over and out of the cliffs, plunging down into emerald green lakes, and chilling the air with invisible mist. Behind this stretch of trees there seems to be a small, thundering noise. Look, you can see a wall of waterfalls beyond this walkway, past the trees. 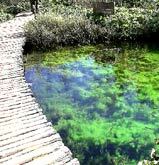 Its streams splash furiously, swirling around and under the wooden planks where I stand. I have found my own soothing travel experience. I continue down the walkway, turning back every once in a while to drink in the beauty that dances all around me. A symphony of sounds follows me down the trail and soothes my soul. I feel myself relaxing even further as liquid ambiance washes away what's left of my troubles. This sign helps me make sense of this stairway of water strung together by thousands of cascades. "Veliko Jezero" means large lake in Croatian. The blue arrow shows my position in this section of the trail. The sign seems to indicate that I am at the 606 meter (1988 foot) marker position, that I still have a two hour hike to go and the falls here are 7 meters (23 feet) high. I could be wrong. My understanding of Croatian is practically nil. But making educated guesses is an important travel skill everyone should try to master. Waterfall after waterfall saturates my mind as I finally reach the lower lakes. The trees are greener here; the leaves have not begun to change. The water slows down to a gentle shimmer as it glides over rocks and branches covered with delicate waves of algae. If you need some soul soothing travel try a National Park anywhere in the world. Find out what made it a National Park. I found out why Plitvice Lake is one of Europe's best. Visiting this place is a "God send of joy."